I haven’t done a Crown and Glory Glitterati unboxing on here for ages, but this month I’ve finally got round to taking some pictures to share with you. 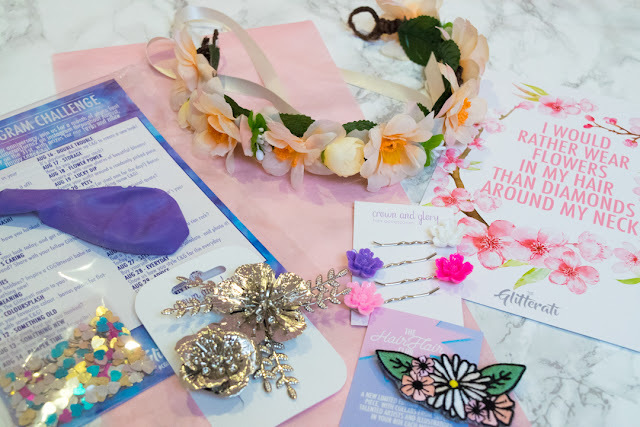 For anyone that hasn’t heard of Crown and Glory, they sell a massive range of beautiful hair accessories covered in glitter, flowers, feathers and more! 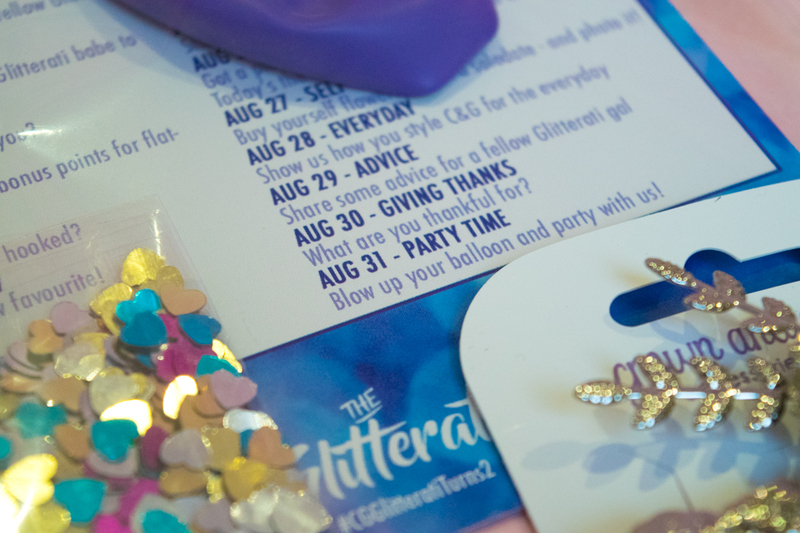 They also do their very own monthly subscription box – The Glitterati, which I’ve been subscribed to for quite a while now. Each month the box has a different theme, and because this month is a special second anniversary box, a poll was put up on the Glitterati Facebook group so we could choose what the theme would be. I always get very excited to open my box and find out what the theme is each month, and this month I was even more excited than usual. 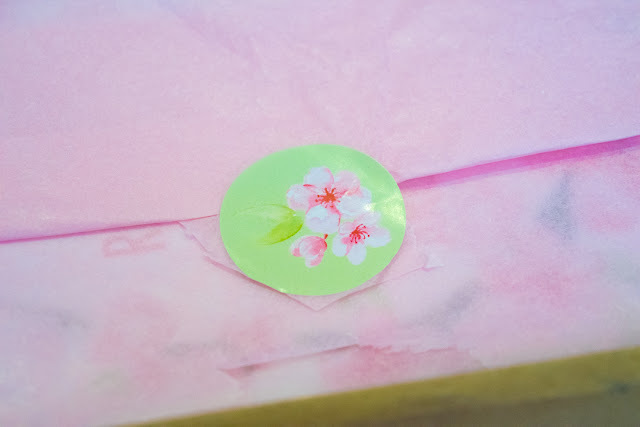 Upon opening my box, I saw the pink tissue paper (always a good thing!) and a gorgeous little pink blossom sticker. The chosen theme was Sakura. 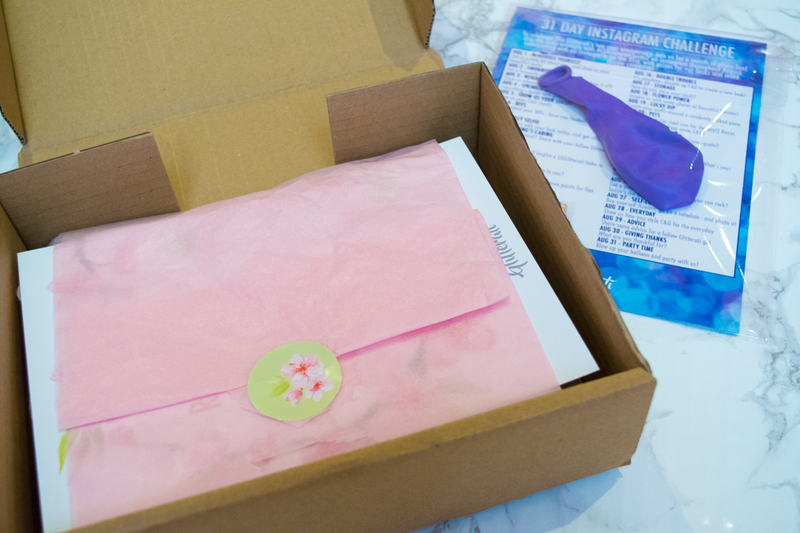 Inside my box was an array of beautiful pieces, which fitted in with the theme absolutely perfectly. 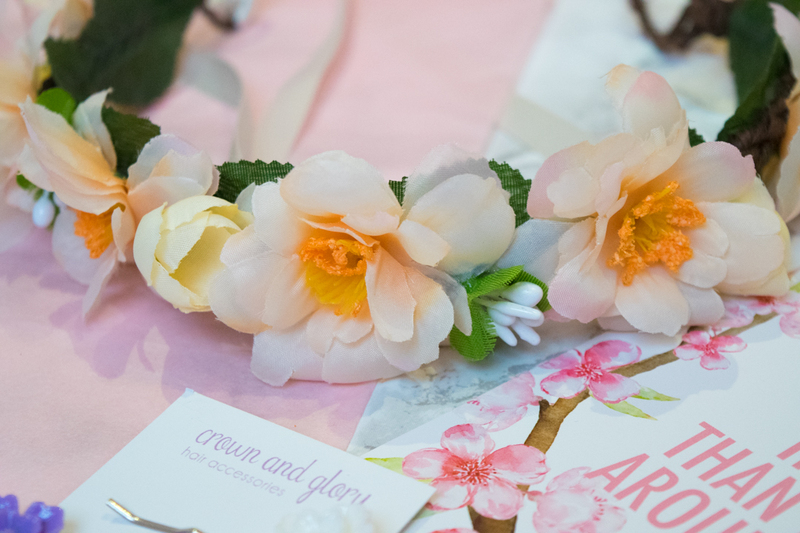 With the overall colour scheme of pink and pastel colours, it definitely suits my taste for all things floral and delicate. I love the fact that the information leaflet has a quote on the back of it, as it means I can pop it on my noticeboard or something, rather than having to just get rid of it. I particularly love this quote, although I wouldn’t say no to diamonds either! 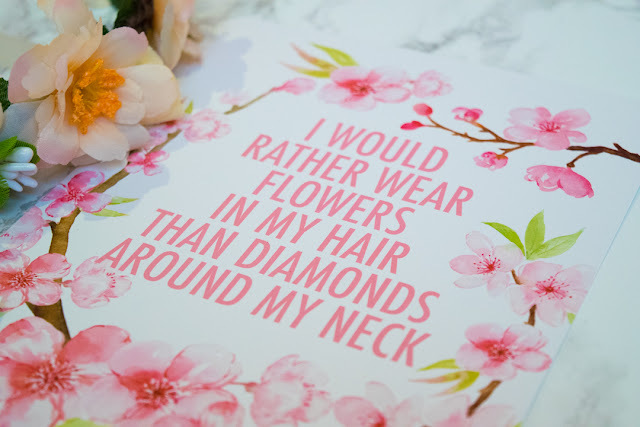 Underneath the quote card was this beautiful cherry blossom crown, which comes in a variety of colours. If I buy things like this, I tend to always choose pink, so it was quite nice to receive something in a colour I may otherwise not choose. You can find a similar crown here. 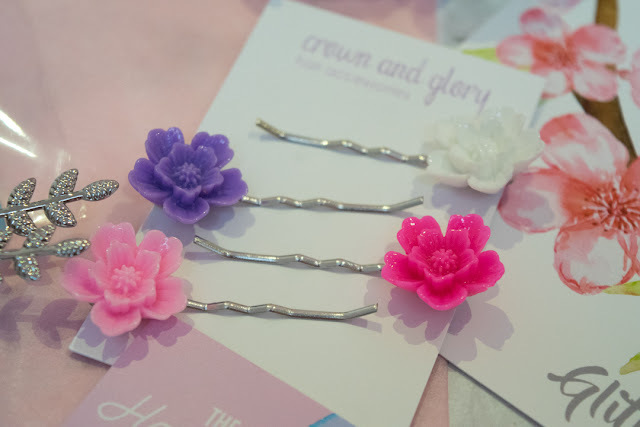 Next up were these four little flower bobby pins in pinks, purple and white. These are right up my street and delicate enough to wear every day. They don’t have these exact ones available to buy, but you can find something similar here. 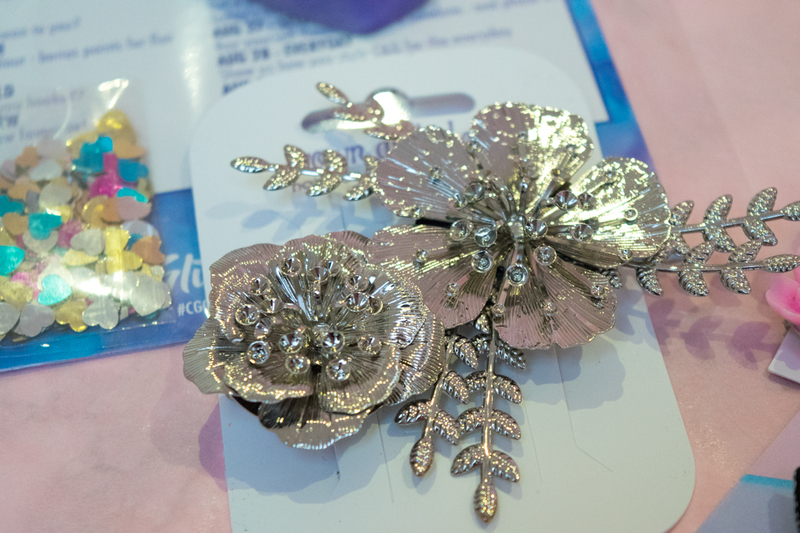 This Sakura hair clip duo in silver really caught my eye. They’re incredibly intricate and beautiful and are available to buy in gold or silver. A new addition to the monthly box is something called The Hair Flair Club. It’s a new limited edition embroidered piece, with collabs from super talented artists and illustrators. This will be in the box every month from now on, which is quite exciting! 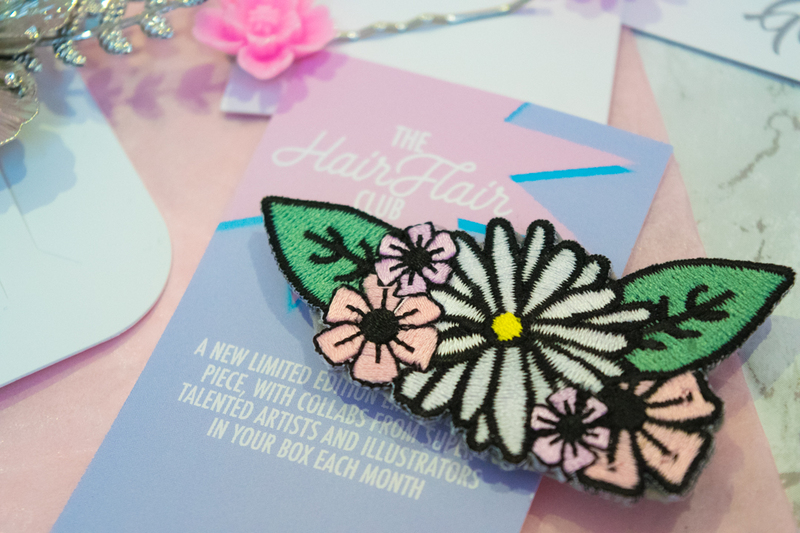 The clip in this month’s box was this beautiful daisy, surrounded by pink flowers and green leaves. I’m really excited to see what future hair flair club pieces will bring! 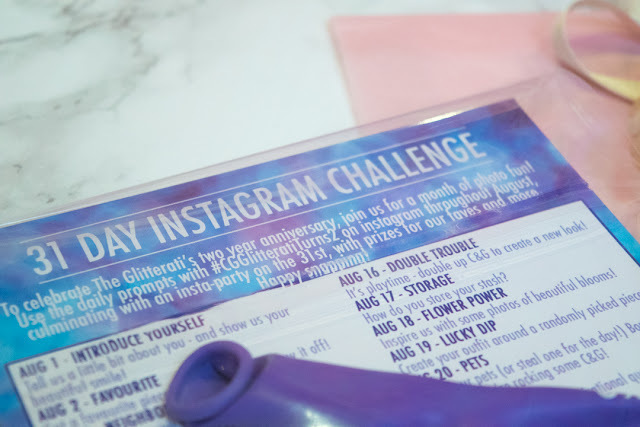 With this being a particularly special, celebratory box, there was also another small packet with a balloon, sparkly confetti and a 31 Instagram challenge. You may have seen, either on my Instagram or Sunday Snippets posts, that I’ve been really enjoying taking part in the challenge over the last few weeks. I’m looking forward to the 31st when I believe there will be some exciting celebrations happening over on our Facebook group. 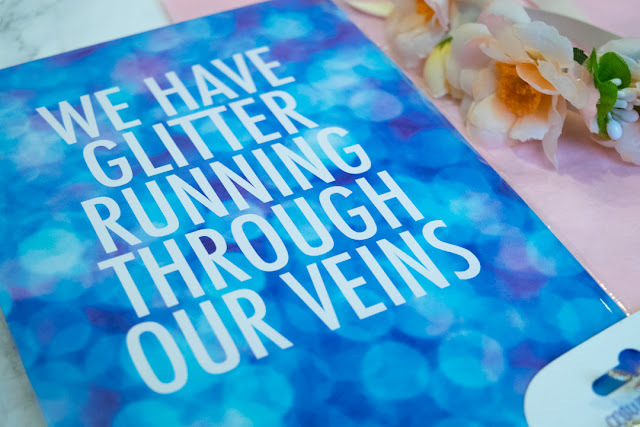 On the back of the Instagram challenge is another quote, which pretty much sums up everyone who is part of the Glitterati! I’m so happy with this box and am really enjoying being part of such a lovely, supportive community. I do enjoy getting a few other subscription boxes, but this is the only one I know of that incorporates a close community of like-minded people who offer love and kindness to each other. Are you a Glitterati member, or have I tempted you to join?! Can you recommend any other subscription boxes? August Birchbag - Dive In!